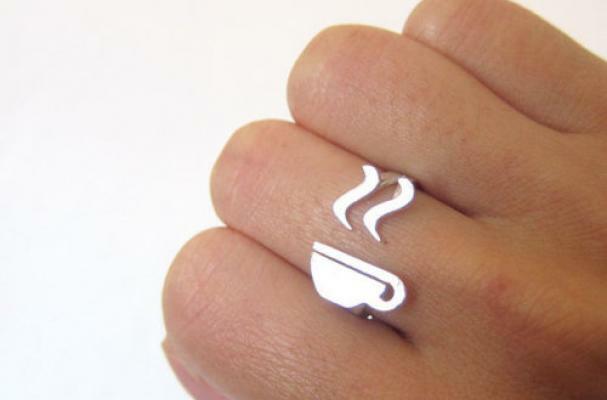 This sterling silver Coffee Ring is perfect for java fiends. The ring features a cup of coffee with two swirls of steam; its U shape shows off the design without a solid band like most rings. The Coffee Ring is just one of SmilingSilverSmith's many sterling silver rings. The other pieces in her collection heavily reference computers, the Internet and video games, featuring emoticons, power buttons, question marks and smiley faces. WOW!!! I want one. Very nice!! I don't (do not) want one. It'd ONLY be cute on a barista...and only at work. How can I get one from Chile! It's $49. Click on the image source for the Etsy page to buy from.